October 20, 2013. The restrictions on Rafah Crossing led to a strange turn of events in September: Erez Crossing has now become the main gateway into and out of the Gaza Strip, although no significant change in Israel’s restrictive policy has taken place. The restrictions imposed by Egypt on travel through Rafah have led to a sharp decline in the number of individuals exiting Gaza via Egypt: from an average of more than 20,000 exits a month during the first half of the year to only 3,412 in September.Meanwhile, nearly 5,000 exits by Palestinians were recorded at Erez Crossing during the month of September, reflecting a 20% increase from the 4,150 monthly average in the first half of 2013. More Palestinians traveled through Erez than through Rafah in August as well, although the difference was only about 200 exits. A look at the numbers reveals that close to 16,000 people who would have traveled out of Gaza every month on average now remain in the Strip without being able to leave. Students, professionals who work outside the Gaza Strip and many others have been stripped of their basic right to travel. Israel does not allow travel to and from the Gaza Strip by sea or air and limits passage through Erez Crossing to “exceptional humanitarian cases”. The result has been dependency on Rafah Crossing. Gisha argues that Israel’s control over Gaza creates obligations under the law of occupation, which applies to Israel but not to Egypt. “Israel’s restrictive travel policy must be reconsidered”, said Adv. Sari Bashi, executive director of Gisha. “Because Israel exercises control over the Gaza Strip, it has a responsibility to allow regular travel. When travel through Rafah Crossing is insufficient, Israel must allow a more significant increase in travel through its crossings”. During September, Rafah Crossing was closed 50% of the time, including Fridays. Erez Crossing was closed 30% of the time, including Fridays and holidays. 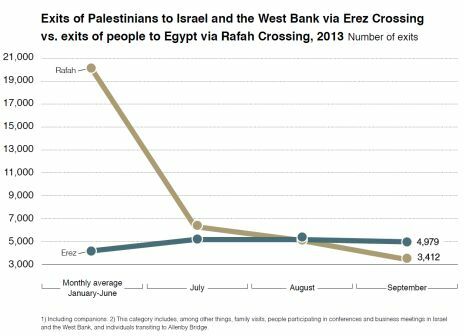 However, there was a 20% increase in exits by Palestinians to Israel and the West Bank via Erez Crossing, compared to the monthly average in the first half of 2013. As a result of the restrictions on travel through Rafah and the number of days on which it was closed, thousands have been stranded in the Gaza Strip with no way out. Though the number of Palestinian exits through Erez has increased, it is still far from meeting the need for travel in the Gaza Strip. So for example, in September, only 63 exits were recorded of individuals traveling abroad from Gaza via the Allenby Bridge border crossing. Although this is ten times more exits than the monthly average in the first half of 2013, the figure still attests to the fact that despite increases in access at Erez, travel abroad remains severely curtailed. There are currently about 4,000 individuals who meet the criteria for travel through Rafah but are being delayed by the long wait to exit. During September, because of the frequent closure of Rafah Crossing, many students in the Gaza Strip were unable to travel to their academic institutions in time and missed the beginning of the academic year. Some students on scholarships from foreign countries received permits to travel through Erez Crossing, but an estimated 500 others are still stranded in the Gaza Strip.